St Michael's, Bampton, has a ring of six bells, the tenor being fifteen and a half cwt, re-cast by Thomas Bilbie at Cullompton in 1800. The bells were re-hung in a metal frame some 30 years ago and have been fitted with new ropes this year after a Millennium appeal. In the tower a 'silent' bell has been installed! - click here for info.! 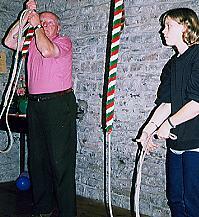 We have a local band of ten ringers and we ring call changes and Plain Bob Doubles. 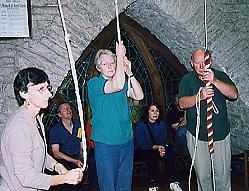 With help from other local ringers we can ring a variety of other Doubles and Minor methods. We are always looking for new recruits of any age, and anyone interested in finding out more is welcome to join us on Thursday evenings. 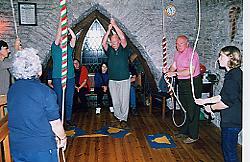 The bells are rung on Sunday mornings from 10.25am to 10.55am, and most Sunday evenings from 5.55pm to 6.25pm. Practice night is on Thursdays from 7.30pm to 9.00pm. Visiting ringers are always welcome. On 19 January 2019, Bampton ringer Mike Hatchett clocked up his 2000th full peal whilst ringing at nearby Huntsham. We are told that fewer than 150 people have ever achieved this in the last 300 years! With reasonable notice, and for a small donation to our bell-ringers' funds, we ring bells to mark special local occasions such as birthdays and anniversaries. Up aloft in the tower, one cannot but be impressed by the massiveness of the bells and the structure which supports them. 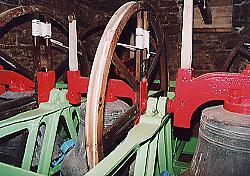 A massive oak frame supported the bells from 1800 until 1962 when it was replaced by the present steel one. 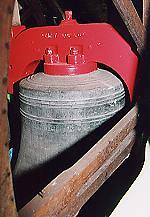 The lightest bell - the Treble - is inscribed: "When I call, follow me all". The Tenor bell, shown on the left, weighing about 15.5 cwt (750 kg) is inscribed: "I to the church the living call, and to the grave do summon all". If you can play MP3 sound files on your computer, you might like to download the sounds of the Bampton bells being rung joyously to celebrate Christmas morning, 2002. As well as the bells you will also hear a variety of Bampton birds joining in! Tower History - a brief explanation of the mysterious art.